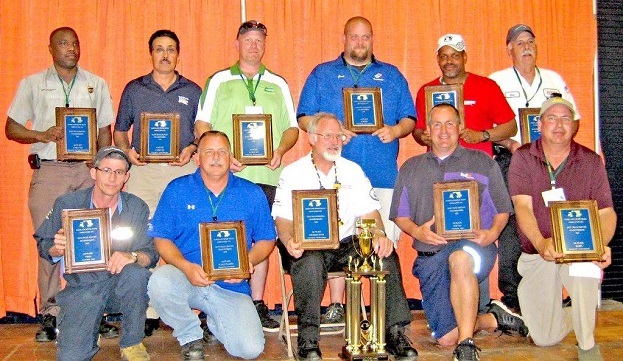 Congratulations are in order for the six delivery professionals who represented Chaney Enterprises on Saturday, June 6th at the Maryland Motor Truck Association Championship in Timonium. Chaney was well represented with three ADPs and three CDPs who advanced to the state level by competing in our company rodeo back in April. Tyrone Brown, Chester Dove, and Guy Billings were among the ADPs who competed and Charlie Carty, Lawrence Gross and Steve Waclawski were the three CDPs that made it to the state competition level. Guy Billings and Lawrence Gross out shined all other delivery professionals by placing first in the dump division (Mr. Billings) and first in the mixer division (Mr. Gross). Chester Dove also ended up placing third in the dump division. Chaney is proud to have such a selection of skilled drivers that take the time after a long week’s work to participate and represent the company they work for so well. Lawrence Gross, shown in the back row, second in from the right. Guy Billings is in the front row all the way on the right.